Break out the goggles! Reedies show Portland schoolkids that science is fun. Photo by Randall Barton. Reed students bring “mad science” to Portland schools. 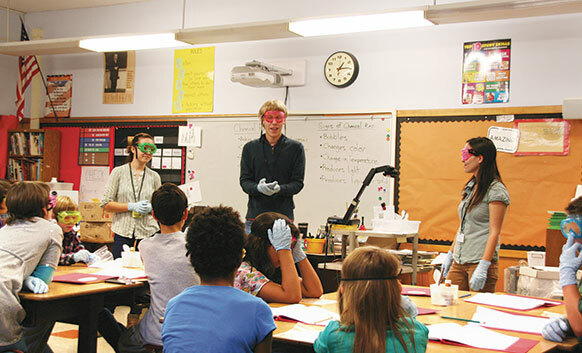 The fifth-graders squirm with excitement as three Reedies pass out candy-colored safety goggles in the classroom at Lewis Elementary School, just a couple of miles from the college campus. One boy, distressed that his goggles are pink, begs that someone trade with him. “We are not trading goggles!” teacher Sylvia Jen interjects from the back of the classroom. She directs her 28 pupils’ attention back to the Reedies who are ready to lead them through a chemistry experiment in which premeasured ingredients are combined in plastic zip bags. “It’s changing color!” squeals one little girl. “The bag is warming up,” a boy adds. Every week Cole, Lisa Hiura ’14, and Erin Kleinfeld ’13 show Jen’s class that science is a fun way to learn about the world. The trio is part of the Reed Science Outreach Program, which has been bringing the thrill of scientific inquiry to Portland schoolkids for more than 20 years. The program had its origins in the summer of 1991; originally, high schoolers came to Reed to take biology lessons from Reedies. After four years, the program was reworked so that Reed students went to elementary schools to teach lessons developed by the Reed biology faculty. The program was an instant hit. Demand for the Reedies was so great that the focus was narrowed to schools with significant populations of disadvantaged students who have fewer opportunities to do science. 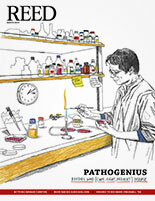 Since then, roughly 400 Reedies have taught science to nearly 10,000 schoolchildren. In 2011, Cole and chemistry major Li Zha ’12 started a Chemistry Outreach Program with funding from the SEEDS program. Twelve Reedies led fifth-graders through experiments such as plugging a pickle into a wall socket to demonstrate how acid conducts electricity. This year the chemistry and biology programs were merged into the Reed Science Outreach Program. Some 42 Reedies offer science lessons in 19 classrooms in six Portland schools, grades four through seven. The program’s curriculum (designed by Reed faculty) is aligned with state and national science standards. Fifth-grade teacher Sylvia Jen is passionate about science and reminds her pupils at Lewis Elementary that the Reedies provide science lessons that she does not have the budget for. Several times a year, the class tours the Reed campus, including a visit to the nuclear reactor. “The program gives [the fifth-graders] a chance to see people who are really enthused about science,” Jen says. Parents tell her their children have developed a newfound interest in science. The program’s annual budget is $70,000, which pays for wages, administration, and materials (participating Reedies earn a modest hourly wage, some via a work-study program). It was originally supported by grants from the Howard Hughes Medical Institute, the Miller Foundation, and the Rose E. Tucker Charitable Trust. Recently Diane Perkinson, Cole’s mother and the wife of professor David Perkinson [mathematics 1990–], made another generous gift to support the program for the next couple of years. Science majors fill roughly half of the teaching positions; other majors are welcomed as long as they are enthusiastic about science. To get ready for teaching, Reedies practice their experiments before a group of elementary-school teachers, who offer tips on presentation and managing a classroom. Energized by the experience, many of the Reedies in the program go on to pursue teaching careers. Teaching fifth-graders takes Cole back to when he first got interested in science. He has discovered that he must adapt to a wide range of learning styles and have absolute clarity about the ideas he’s presenting. During class, the fifth-graders ask the Reed students “What do you do at college?” and similar questions. “The children are at a point where they can still make a lot of choices that will help set them on that path,” Gonyer says. Science Outreach uncovers a lot of things that don’t show up on the periodic table. Bringing science to children develops poise, self-respect, and leadership. It also broadens Reed’s commitment to the life of the mind.